A locksmith found four glass vials of tear gas while trying to reprogram the combination to the safe for a store owner. "In order to do that I had to take the back off the safe," said Locksmith Jeff Reppert with JR Lock and Key. "When I did that there was another unit attached which was something they put on there in the 30's and 40's as a deterrent for the burglars," Reppert explained. Tradelocks have welcomed the arrival of over 120 different lines of Peterson Tools in what some have seen as a major and significant shift in Tradelocks trading strategy. 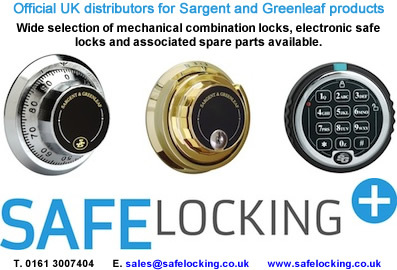 Tradelocks are known for working with locksmiths and developing quality tools at low prices and also selling online their range of UAP locks and door products at low trade prices, so distributing the Peterson brand is an interesting move. A proposed law in South Africa that would require foreign-owned private security firms to sell at least 51 percent of their businesses to South Africans will deter foreign investors and violate international trade deals, a business group said recently. Leading global provider of security and safety solutions, Allegion, bolsters its CISA eSIGNO Contactless Locks with the addition of a stylish new lever and optional handle plate finishes. The market-leading access control product comprises an innovative design with advanced security features and is now available in four finishes; satin silver, polished silver, satin bronze and polished gold - enabling the hospitality sector to combine top security levels with sleek designs. Canon, world leader in imaging solutions, today announced it has signed an agreement to acquire Denmark-based Milestone Systems A/S, a world leading provider of open platform video management software, via its subsidiary Canon Europa N.V. The new combination will create a formidable player in the fast growing network video surveillance market by combining the strengths of Canon’s innovative imaging technology with Milestone’s best in class video management software expertise. Introducing the TL Rim Cylinder - We Came. We Saw. We Conquered. "We have been asked many times to develop a budget Rim Cylinder, but we didn't want to just launch something that was the same as what is already on the market. Instead we sat back, asked a lot of questions, and sampled a lot of product. And now we have what we believe to be one of the best Rim Cylinders on the market! Skyguard - Europe's personal safety service for lone workers, is launching an iPhone version of its 'Skyguard for Smartphone' software. The app, which converts an iPhone into a fully functional personal safety device, is an expansion of Skyguard's range which already includes software for Android, Blackberry, Symbian and Windows Mobile handsets, as well as dedicated devices. Utilised by universities across Australia and Asia, CriticalArc's SafeZone meets the challenges of efficiently managing everyday security operations through to full-scale emergencies across large and geographically dispersed facilities. Security workers in New Zealand are spending up to NZ $1300 on stab-proof vests to protect themselves against violent attacks in increasingly high-risk jobs, say suppliers of the hi-tech garments. A rising number of security guards, door staff, animal control officers and noise patrol officers are wearing the vests to reduce the risk of life-threatening injuries on the job. Oh well. It was nice business while it lasted. Tourists have been evacuated from one of the most iconic bridges in Paris after it began to crumble under the weight of thousands of 'love locks'. A chunk of the Pont des Arts bridge fell away on Sunday night and the police were called to seal off the area. BBC TV has once again warned householders about criminals using lock snapping techniques to break into their homes. In its Crimewatch Roadshow programme on June 24, householders were advised to change their door lock Eurocylinders to 3 star TS 007 cylinders. TS 007 is a Kitemark cylinder standard developed by the Door & Hardware Federation (DHF) and the Glass & Glazing Federation, in consultation with Secured by Design (the Association of Chief Police Officers’ crime prevention initiative), the British Standards Institution, and other leading industry organisations. OK, we British don't seem to have a lot to celebrate, as the 4th July was the time we gracefully withdrew and gave up claim to the American colonies. But to be fair, this has given them the chance to hold an annual celebration, and those Americans don't need too many reasons to get out the tickertape and hold a parade. Also did you know that 3 of the founding fathers of the USA all died on July 4th! So as a bit of light relief we, at Tradelocks, think that we should celebrate the 4th July with them. We have all seen the news with programs like the BBC's Watchdog, where consumers raise questions about the security systems on their vehicles. These news stories highlight the current threats facing OEMs, but the reality of the situation is far from simple. What has changed and why is the number of car thefts starting to rise again? 911 Security Systems have installed door controllers, proximity readers and cards from Access Control Technology (ACT) as part of a marine access control solution with 3,500 users. A unified system is operating internationally across 40 doors, with ferry staff at the ports of Dublin, Republic of Ireland, and Cherbourg, France, using their access control cards in both countries. The equipment is at buildings run by Irish Ferries, and crew with appropriate access rights can simply present their credentials at the ferry company’s facilities in Ireland and France. Industry veteran Ken Garbez has been promoted to new role as Vice President of Operations for High Tech Locksmiths. "Ken will be a great asset to High Tech Locksmiths," says Jay Wiener, HTL CEO. "He is an auto industry veteran who possesses a unique ability to efficiently and effectively manage operational functions while also building and maintaining strong relationships both inside and outside the company." Allegion (formerly known as Ingersoll Rand Security Technologies) has beat off strong competition to secure contracts totalling £1.25 million, which will see the safety and security specialist provide 600 steel doorsets for Europe’s biggest construction project – Crossrail. Allegion has been appointed by Canary Wharf Construction Ltd – a wholly owned subsidiary of Canary Wharf Group plc – to supply Martin Roberts fire, acoustic and over clad steel doorsets. For the third consecutive year, Hikvision has been ranked as the world's largest CCTV and Video Surveillance Equipment provider in 2013 with a dominant 10.9% market share. This is up by more than a third, from 8% in 2012, according to the latest report from IHS. From Cyber Security-intelligence: eleven signs you've been hacked! This used to mean reformatting the computer and restoring all programs and data. Today, depending on your operating system, it might simply mean clicking on a Restore button. Either way, a compromised computer can never be fully trusted again. The recovery steps listed in each category below are the recommendations to follow if you don't want to do a full restore, but again, a full restore is always a better option. Family owned business Mint Security Systems has announced a move in to the prestigious Welbeck Estate in Worksop along with the creation of a new local employment position. The contemporary office space in North Nottinghamshire is ideally located for the CCTV and intruder alarm installers thanks to its prime location in the centre of the three counties Mint Security serves; Derbyshire, Nottinghamshire and South Yorkshire. The brand new office is located in Pineapple Lodge, a Grade II listed building within the Welbeck village, in the heart of the Estate’s beautiful scenery. The Welbeck Estate spans 15,000 acres and contains historic rural heritage buildings such as abbeys, and areas of outstanding natural beauty including woodland, a deer park, a sequence of lakes and picturesque farmland. iBin Innovations Ltd has selected KitLock 1000 cabinet locks to secure its range of parcel delivery boxes. iBins provide a convenient and safe place for couriers to leave home delivered goods when there's nobody at home to sign for them. "While Internet shopping itself is convenient because you can browse and compare products from the comfort of your own home, waiting in for the delivery isn't," explains Andrew Burton, owner of iBin Innovations Ltd.
Police Scotland has recently announced details of the security suppliers selected to deliver a safe and secure Commonwealth Games in Glasgow this summer. Following a robust and competitive tendering process, which examined key factors including capability and value for money, a total of 17 companies have now been contracted to deliver security and stewarding services at the event, which commences next month after seven years of careful planning. Genuine Lishi launched their re-developed website last Tuesday, right here on LASN. 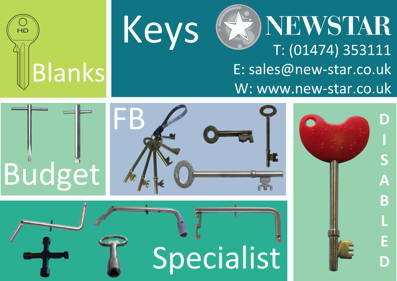 And in that first week over 1000 Locksmiths have taken the chance to subscribe for FREE to this new resource website. The Genuine Lishi website has been developed with the Auto locksmith very much in mind. It acts firstly as a free resource for selecting the right tool for going to a job. So when a job comes in, the AutoLocksmith can ensure they have the right equipment before they step foot outside their door. Second, the site is where all new tools can be registered to get the new FREE LIFETIME GUARANTEE launched by Genuine Lishi. Shearlocks from Alpro Architectural Hardware are being used to secure the Three Hills Sports Park in Folkestone, Kent. The £7m park is a centre of sporting excellence providing national-standard facilities for hockey, cricket and netball. The Alpro units have a shear holding force of 1,200kg and are securing doors on the main pavilion and indoor training facilities. They were installed as part of a £7m scheme to convert a dilapidated recreation ground into inclusive community facilities which have increased public participation in sports activities.